REX Conventional Green Concentrate antifreeze and coolant is an ethylene glycol based ready to use blend with nitrite-borate buffered inhibitor package that has been the standard conventional coolant over many years. 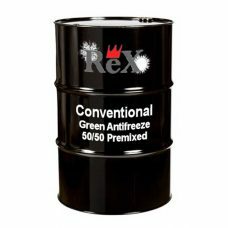 ReX Conventional Green is compatible with all conventional green coolants and provides year round protection. REX Premium Extended Life 50/50 pre-diluted antifreeze and coolant is a multi-vehicle, low silicate hybrid formula that is compatible for use in a wide variety of automobiles and light duty trucks. The additive package in this blend is nitrite free, contains a high level of organic acid, and has the additional protection of molybdate. This potent package provides excellent engine and cooling system protection. Compatible with all automotive and light duty truck (foreign or domestic) in the market today. When used in a flush and refill service of the cooling system, the product will provide 5 years, or 150,000 miles of service (whichever occurs first).